Carver students compete in regional robotics competition! FIRST LEGO League (FLL) challenges Carver kids each year to think and create like scientists and engineers. Carver’s after school STEAM programs such as this one receive crucial financial support from a 21st Century Community Learning Centers (21st CCLC) competitive federal grant. Here are similar stories about Carver FLL teams competing in 2017 and 2016. During the 2018/2019 INTO ORBIT FLL season, teams choose and solve a real-world problem. They build, test, and program an autonomous robot using LEGO MINDSTORMS technology to solve a set of missions in the Robot Game. Throughout their experience, teams operate under the FIRST signature set of Core Values, celebrating discovery, teamwork, and Gracious Professionalism. This year’s regional FLL competition was held on Saturday, November 17, 9:00 AM to 4:00 PM, at Saint Mary School in Ridgefield. 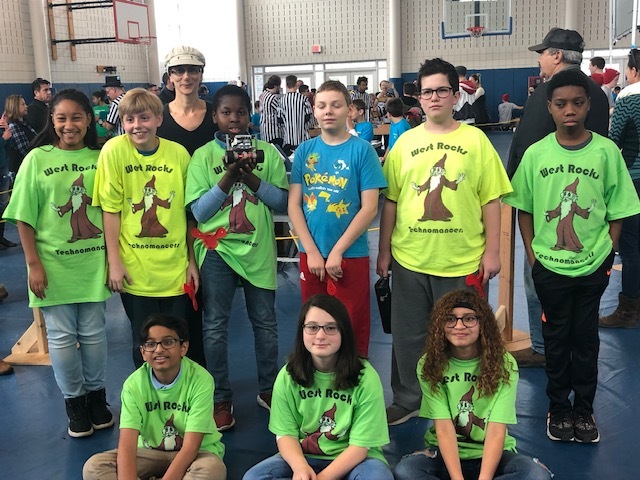 Carver teams represented Roton Middle School (the Ramzillas team coached by Jennifer Howard-Baker) and West Rocks Middle School (the Technomancers team coached by Vicki Gacesa). 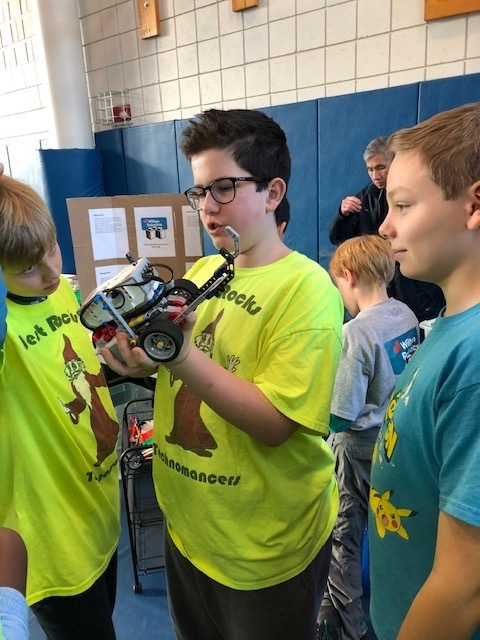 Ethan Allen Prep in Ridgefield hosted this FLL Robotics Competition Qualifier. They named the event "The Gathering of the G.O.A.T." G.O.A.T. stands for 'Greatest of All-Time,' and since "Robotics is the Sport of the Mind," the team stated that they always strive to be the G.O.A.T. in everything they do. Sixteen middle school teams from throughout Connecticut competed. Other team names included E.P.I.C. (Exceptional People Impacting the Community) and G.L.O.W. (Girls Lead Our World), each were all-girls robotics teams from Danbury. The Ethan Allen Preparatory robotics team was called Disruptive Technologies. 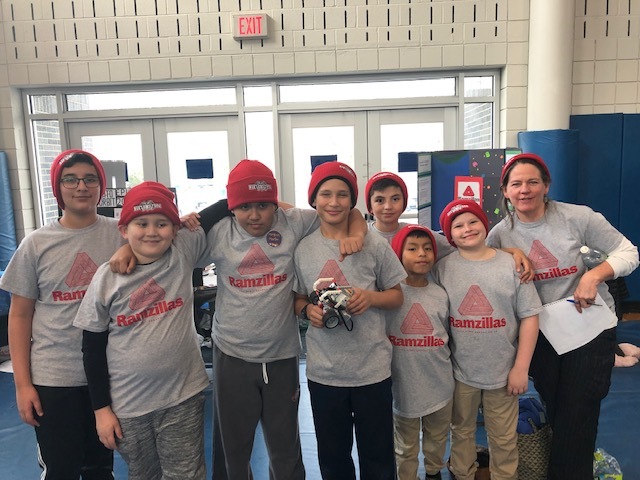 FLL robotics tournaments provide a cheerful atmosphere in which students solve a complicated “mission” with the help of a robot. Teams research a given topic, and are then tasked with planning, programming and testing an autonomous robot to solve the mission. The FLL teams experience all the steps of a real product development process. Carver STEAM after school projects are facilitated by certified teachers hired from within each of the Carver school sites. They deliver Science, Technology, Engineering, Arts and Mathematics programming through small group instruction using strategies consistent with CT’s Common Core State Standards for Mathematics and the CT’s Science, Technology Education and Arts Curriculum Frameworks. The 21st CCLC grant is authorized under, Title IV, Part B of the Elementary and Secondary Education Act (P.L. 107-110), as amended by the No Child Left Behind Act of 2001 and reauthorized by the Every Student Succeeds Act (ESSA) of 2015. The 21st CCLC grant is administered by the Connecticut Department of Education and provides funding for the establishment of community learning centers to provide students with academic enrichment opportunities. In addition to academics, 21st CCLC permits Carver to offer students a broad array of other services and programs as well as support for parents.